Blaze Media Pro includes powerful features to burn CDs (music, data, video DVD, video VCD and SVCD). Music CDs can be burned from MP3, WAV, WMA, and OGG files to an audio CD that can be played in any standard CD player with ease. 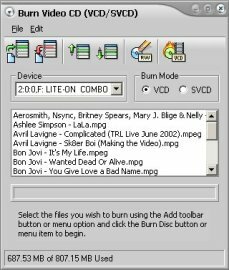 To burn music CDs, click "Burn CD/DVD" from the software's main interface, and select the "Burn Audio CD" menu item. You can then simply add the files from which you wish to burn CDs to the list by clicking the Add button. If you have many files in a single folder to add, you may also use the Add Path option, which will add all the audio files in a given folder to the list. Once the audio files are present in the list, set any desired settings for your device to burn CDs or configuration (optional), and click the "Record Audio CD" button to begin burning the CD. Blaze Media Pro's music CD burner feature offers a very fast and efficient multi-threaded burning process and is highly compatible with most any IDE and SCSI drives on the market today. 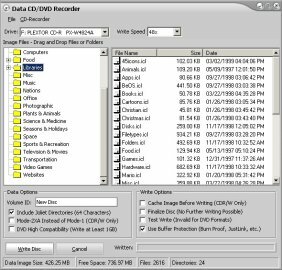 Blaze Media Pro also includes the ability to burn data CDs quickly and easily. To use the software to burn CDs for data files, click the Conversions > Burn Data CD/DVD menu from the software's main window or select Burn Data CD/DVD from the Burn CD / DVD popup menu. From the resulting window, you can easily choose the files you wish to burn. The software can also add entire folders to the CD/DVD structure using the Add Path command from the burn CDs window's File menu, making backups a breeze. With the files to burn present in your list, select the device to use to CD burns and click the Write Disc button to burn the current disc structure to CD or DVD. The data DVD/CD burner feature fully supports multi-session discs; offers complete rewritable disc support; and optimized burning to take advantage of the drive's highest writing speed. Furthermore, video DVDs and VCD/SVCD discs can also be burned using Blaze Media Pro. Both options are available via the same Conversions menu or Burn CD/DVD popup menu. For DVD, MPEG-2 video with DVD-extensions is used. VCD uses MPEG-1 video with VCD extensions. SVCD uses MPEG-2 with SVCD extensions. You can use the software's video converter feature to convert to any of these specifications with ease in preparation for the burning process. Blaze Media Pro's video DVD/CD burner does not require an ASPI manager for NT/2000/XP/2003 and utilizes superior data buffering for the fastest burning possible. The software's process to burn CDs is very fast and easy to use. 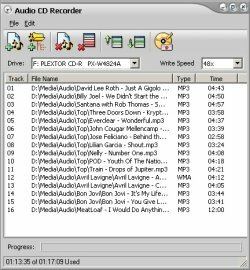 Advanced options are available for those who want to take advantage of them, though they are completely optional, making Blaze Media Pro the perfect software to use when you want to burn CDs (audio, data, or video) for users of any experience level.